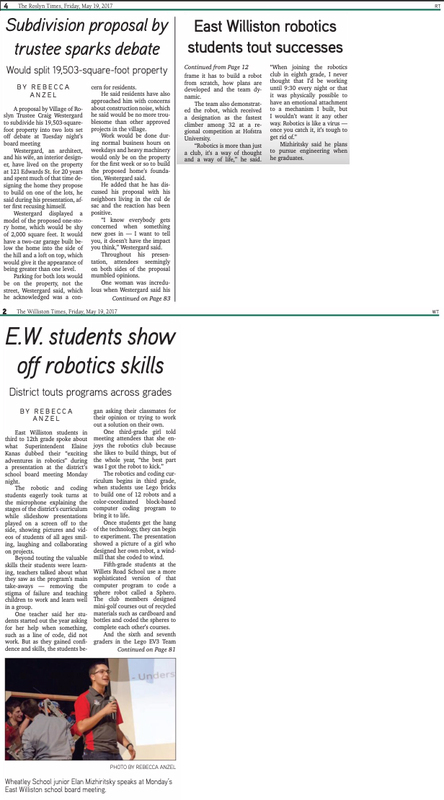 East Williston students in third to 12th grade spoke about what Superintendent Elaine Kanas dubbed their “exciting adventures in robotics” during a presentation at the district’s school board meeting Monday night. 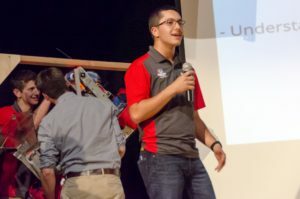 The robotic and coding students eagerly took turns at the microphone explaining the stages of the district’s curriculum while slideshow presentations played on a screen off to the side, showing pictures and videos of students of all ages smiling, laughing and collaborating on projects. Beyond touting the valuable skills their students were learning, teachers talked about what they saw as the program’s main take-aways — removing the stigma of failure and teaching children to work and learn well in a group. One teacher said her students started out the year asking for her help when something, such as a line of code, did not work. But as they gained confidence and skills, the students began asking their classmates for their opinion or trying to work out a solution on their own. The robotics and coding curriculum begins in third grade, when students use Lego bricks to build one of 12 robots and a color-coordinated block-based computer coding program to bring it to life. The Roslyn Times, top, and The Williston Times published this piece in print on Friday, May 19, 2017. Once students get the hang of the technology, they can begin to experiment. The presentation showed a picture of a girl who designed her own robot, a windmill that she coded to wind. Fifth-grade students at the Willets Road School use a more sophisticated version of that computer program to code a sphere robot called a Sphero. The club members designed mini golf courses out of recycled materials such as cardboard and bottles and coded the spheres to complete each other’s courses. And the sixth and seventh graders in the Lego EV3 Team not only build and code robots, but they work together to complete challenges at competitions. The oldest students also compete in competitions. Elan Mizhiritsky, a junior, spoke about Wheatley School’s robotics team, describing the two competitions it attends each year, the six-week time frame it has to build a robot from scratch, how plans are developed and the team dynamic. 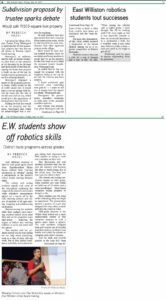 The team also demonstrated the robot, which received a designation as the fastest climber among 32 at a regional competition at Hofstra University. Mizhiritsky said he plans to pursue engineering when he graduates.